It looks like we were right on the money, as Relic and THQ have officially announced the first single player and multiplayer expansion pack for Dawn of War 2. The expansion is called Chaos Rising, and it features Chaos Space Marines of the Black Legion as the main enemy. The expansion will deliver an all new co-op campaign as well as raising the level cap of your units from 20 to 30. Players can use their existing squads from the first campaign in the second. You can also expect to find all of the races gaining new units, as well as the Chaos playable in online versus. One of the more interesting new features it the chaotic war gear which has the power to corrupt your units in exchange for stronger abilities. There will be a full preview in the October issue of PC Gamer, so keep an eye out for it. We've heard a rumor that co-op might be increased in the number of players available - so definitely keep an eye out! AGOURA HILLS, Calif. September 21, 2009 -- THQ Inc. (NASDAQ: THQI) today announced Warhammer® 40,000TM: Dawn of War® II – Chaos RisingTM, the next standalone chapter in the critically acclaimed Real-Time Strategy (RTS) series, is scheduled for release on Games For Windows-LIVE in spring 2010. Warhammer 40,000: Dawn of War II – Chaos Rising features a new playable army, the traitorous Chaos Space Marines, and continues the epic journey of the Blood Ravens as they battle this new, more personal enemy. Developed by award-winning internal studio Relic Entertainment, Chaos Rising offers new single-player and co-op campaigns, a level cap increase from 20 to 30, more powerful war-gear and a suite of innovative multiplayer options. The exclusive first look preview ofWarhammer 40,000: Dawn of War II – Chaos Rising will be featured in PC Gamer’s December issue, available on newsstands by October 12. Set in the grim, war-ravaged world of Games Workshop’s vast Warhammer 40,000 science fiction universe, Warhammer 40,000: Dawn of War II – Chaos Rising transports players into the midst of an intergalactic war between ancient enemies. Warhammer 40,000: Dawn of War II – Chaos Rising introduces the Chaos Space Marines as a new playable army, continues the single player campaign from the original Dawn of War II, delivers all new wargear and raises the level cap from 20 to 30. Relic Entertainment will also deliver new multiplayer maps and new units for the Orks, Eldar, Tyranids and Space Marines. Veterans of the Dawn of War II single player campaign can use their existing squads’ accumulated wargear, abilities and experience to battle the traitorous Chaos Space Marines of the Black Legion throughout 20 new missions. Newcomers to Dawn of War II will begin the single player campaign with a squad of Space Marines fully equipped to take on the malevolent forces of Chaos. Powerful Chaos tainted wargear can be equipped and used against your enemy, but doing so could lead to dreadful consequences. Will you risk corruption for power? 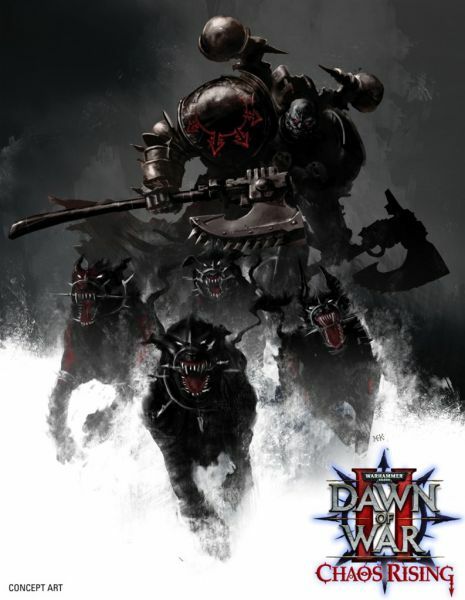 For more information on Warhammer 40,000: Dawn of War II – Chaos Rising, please visit www.dawnofwar2.com. Page created in 0.2208 seconds.